Don’t expect the E-Commerce boom to fade any time soon. Consumers love the instant point-and-click gratification of an online purchase; all from the comfort of their living room couch or on the fly from their mobile devices. Amazon, Zappos, Best Buy and even Home Depot are driving the explosion of new categories each year. With a myriad of choice and quick delivery, U.S. E-Retail sales will grow from $263 billion in 2013 to an expected $414 billion in 2018- an annual growth rate of 9.5%. 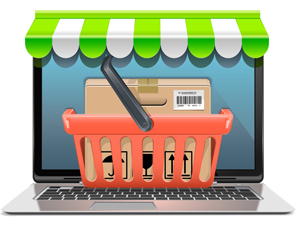 E-Commerce is certainly BIG business and it’s generated almost entirely of very small orders. The average value of an online order in 2014 was just $75 dollars, comprised of a single item to a handful of products per order – all shipped direct to your doorstep vs. traditional brick and mortar store fronts. No surprise, consumer expectations for convenience, variety and speed has had a tremendous impact on the retail supply chain, driving considerable demands on logistics and the physical layout of storage and fulfillment centers. The first step is to restructure your storage and order fulfillment systems for quick throughput of multiple small orders, all each or piece pick. 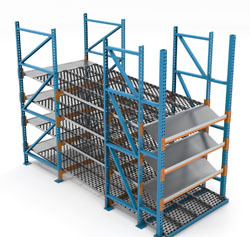 You’ll want to consolidate the order picking activity – move from traditional pallet rack storage – to a forward pick area or multi-level pick module. 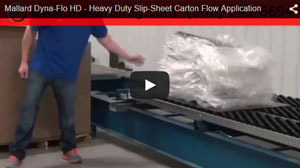 A pick module integrates carton flow with high-speed conveyance for quick order throughput. A large number of SKUs are condensed into a small footprint SKU capacity by up to 50% while significantly improving productivity; order pickers don’t have to travel to pick items. Check out one of our latest custom carton flow solutions developed in our in-house Engineering testing lab using Dyna-Flo (HD). Heavy-duty Dyna-Flo is used to store rubber floor mats stored in poly-bags. The bags are stacked on thin slip sheets, placed on the load-side slip plate. The fully stack load is pushed slightly off the slip plate to flow gently to the opposite side for individual pick for customer orders. 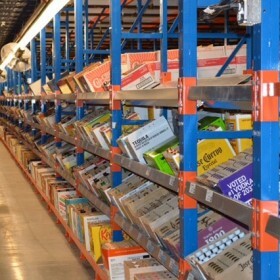 Case picking from carton flow vs. selective rack saves time and space, but standard case flow with flush shelf facings can have some limitations, especially for each pick/E-Commerce applications. Consider adding a tilt-tray for these item locations. Cartons flow from load end as in a typical system, with the first carton pushed gently onto a tilted tray located at the discharge side. Open cartons placed in the tilted position adds better visibility and accessibility to individual items. Need help designing a custom case-pick system? No problem. Using your inventory and SKU velocity reports, Mallard’s carton flow specialists will help you design the optimal product configuration for maximum picking efficiency.